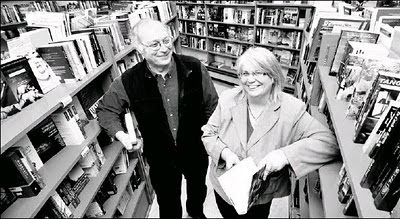 Ray Viaud and Jane Bouey help keep books on the shelf and moving out the door at the People's Co-op Bookstore on Commercial Drive in Vancouver. Jon Murray photograph. Fraternal greetings to People’s Co-op Books on glorious anniversary of 65 years of irrefrangible service to workers and peasants of British Columbia! All hail the visionaries who, in 1945, in the aftermath of the great patriotic wartime alliance between Allied forces and the Soviet Union, decided to continue fighting fascism with books instead of bullets. They sold shares in their cooperative for $1 each. The original members counted among themselves a trapper, a welder, a machinist, a housewife, and a motorman. Today, the shares sell for the same bargain price. Buy 10 shares, get 10 per cent off all purchases for an entire year. The co-op has run an annual loss in almost every year of its existence, surviving on bequests and donations. The reds have been awash in red ink. No wonder they critique capitalism. People’s Co-op has endured blacklists, the Cold War, and the harassment of RCMP surveillance. It has also survived revelations of Stalin’s crimes; the crushing of dissent in Hungary, Czechoslovakia, and Poland; and, the fall of the Berlin Wall, the tearing down of the Iron Curtain, and the dissolution of the Soviet Union. The shelves of People’s Co-op were once filled with the works of Dyson Carter (“Russia’s Secret Weapon,” “We Saw Socialism”), as well as magazines with such cheery headlines as “No tooth decay in the Soviet Union.” Now, a browser is more likely to find titles in subjects (homosexuality, environmentalism) that might, in another decade, have been dismissed as petty bourgeois affectations. In its early days, the store offered hard to find socialist and Communist literature, as well as record albums by such blacklisted American artists as Pete Seeger and Paul Robeson. When American authorities seized Mr. Robeson’s passport, which prevented him from attending a trade-union convention in Vancouver, the bookstore helped sponsor a concert. Some 40,000 gathered at the Peace Arch border crossing, listening to the great singer’s bass baritone amplified as he performed from the rear of a flatbed truck. An early manager of the store was a rumpled satyr with a boyish nickname and a felicitous surname. Merwyn (Binky) Marks was known to carry his lunch in one pocket, the store’s receipts in the other. On a sailing expedition up Indian Arm, he fished in his pocket for a chunk of ham, attaching it to a hook which he then trailed behind the boat. At the end of the day, he reeled in the line, removing bait untouched by fish, which he then proceeded to eat. Mr. Marks left the store soon after the crushing of the Hungarian uprising of 1956, going on to manage Duthie’s celebrated paperback cellar. Eventually, the People’s Co-op table at the fair’s Showcase B.C. Building included such items as $2.50 Lenin lapel pins and $149.95 matroshka dolls. They sold somewhat less briskly than shammies and kitchen gadgets pitched at neighbouring booths. A big break came when the Soviets opened a pavilion at Expo 86 featuring a larger-than-life statue of Hero of the Soviet Union Yuri Gagarin, the first human in space. Though many of their customers opposed the fair, which was seen as a promotion of business and Social Credit, the co-op agreed to operate a souvenir kiosk inside the pavilion. The space was doubled after the first week. The cash register rang and rang and rang. The store even unloaded 10,000 copies of a special edition of the "Communist Manifesto." After splitting profits with the distributor, the co-op wound up with more than $90,000 in profit. People’s Co-op has enjoyed a lifespan greater than that of Lenin and Karl Marx. In four years, it will have outlived the dystopia once celebrated as a workers’ paradise. On Friday, the co-op is holding a fundraiser with music, literary readings and standup comedy to mark their anniversary. George Bowering, Canada’s first poet laureate, is among those who will perform at the WISE Hall in Vancouver. In recent years, the store has championed local literature, often operating book tables at readings and other events. Readers of the world, unite. You have nothing to lose but your chain stores. One of my first jobs as a lad new to Vancouver was in the Paperback Cellar for Binky. He was a strong and positive influence on my young life (that's why I became a nudist and a Communist... no that part's a joke.) The young lovely who was to become and still is my wife already thought it was pretty cool that I worked in the legendary Paperback Cellar but once I took her to one of Binky's Boxing Day parties she was a goner. I never tire of telling the story of the woolly character who looked like he just got out of his sleeping bag in Stanley Park asking Binky if his special orders had arrived. Remember how Binky would stand shoulder to shoulder with the person with whom he was conversing, both parties looking out in the same direction? Told that the books on order had not arrive yet the woolly character turned and in exasperation cried "How do you expect us to wage revolution in this town if you won't get us the books?" I became capitalist since I started to work in viagra online. because the philosophy there is ""A product is any good produced for exchange on a market. ""